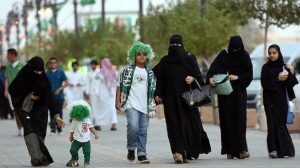 Saudi women will be allowed to enter a stadium for the first time this weekend as the kingdom marks its 87th national day. The kingdom known for its arch implementation of Islam has never allowed women to enter a stadium or sport venues to attend an event. 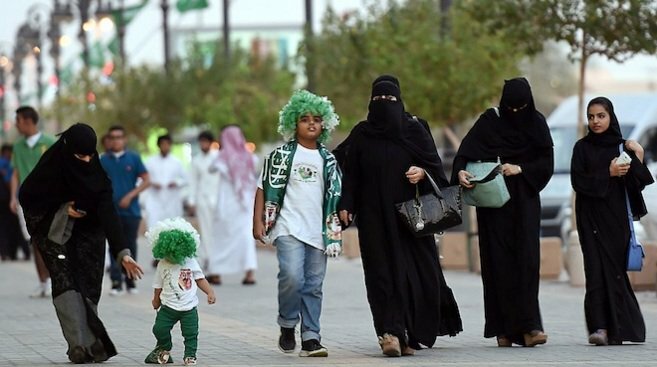 Men, children as well as women will congregate in King Fahd stadium in Riyadh to mark the annual national day celebration, reports say. Though allowed in, women will be sitting separately from men. About 40,000 people are expected to attend the event. The kingdom has embarked on a women promotion policy marking a shift in the longstanding policy of the largest Sunni Arab nation. Authorities have recently allowed women to take up jobs and new roles so far reserved for men. Schoolgirls have been also allowed to attend physical education classes. Posted by KanelkaTagba on Sep 21 2017. Filed under Gulf News, Headlines. You can follow any responses to this entry through the RSS 2.0. Both comments and pings are currently closed.